Welcome to Rusty Eck Ford in Wichita, KS! In 1953, O.L. "Rusty" Eck purchased his first Ford dealership in his hometown of Haven, KS, and the Rusty Eck Ford legacy has been in constant motion ever since. 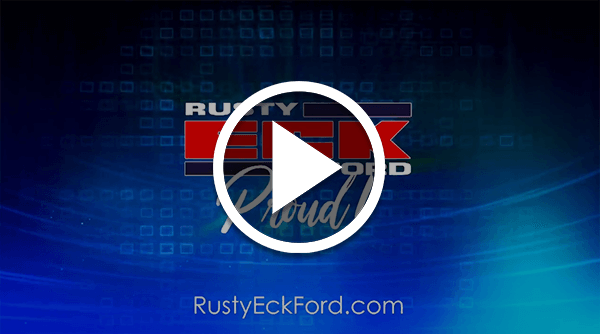 Welcome to Rusty Eck Ford, a modern and welcoming Ford dealership that has over six decades of taking a customer-oriented approach toward every facet of our business. When you visit our Wichita, KS, Ford dealer, you'll be treated like a member of the Eck family, every time. Are you looking to buy a brand-new or new-to-you Ford car, truck or SUV in Wichita, KS? We have an excellent new Ford inventory to explore, so you can get the keys to a new Ford F-150 pickup or new Ford Escape SUV you'll love. If you'd prefer to finance a used Ford SUV, car or truck, we have a wide variety of pre-owned Ford models as well as other used cars for sale. Once you're ready to buy or lease the new or used Ford of your choice, you can speak with our Ford financing team to determine which Ford lease or loan options are right for you. If you're already satisfied with your current Ford vehicle, you can rely on Rusty Eck Ford to be your go-to source for expert Ford maintenance and repairs. Our Ford service department is always here to help you with Ford oil changes, engine checks and body repairs. We have a generous selection of OEM Ford parts, too, so you can find exactly what you're looking for. 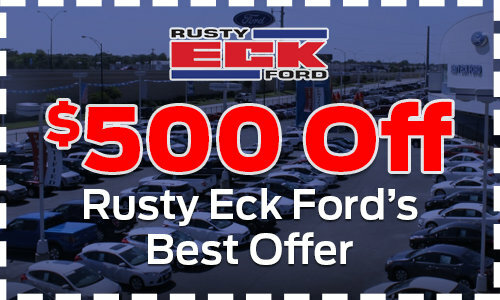 Rusty Eck Ford is conveniently located at 7310 E Kellogg Ave in Wichita, KS, which is easily accessible from Derby, Andover, Bel Aire and all surrounding areas in South Central Kansas. We can't wait to help you drive home in a new or used Ford, or be your trusted location for Ford service, parts and financing. At Rusty Eck Ford, we always put the customer first!